You don't want to miss these fabulous giveaways going on over at Miss Print's blog! The talented Kaye Prince is celebrating her Two-Year Blogiversary... HAPPY BLOGIVERSARY! 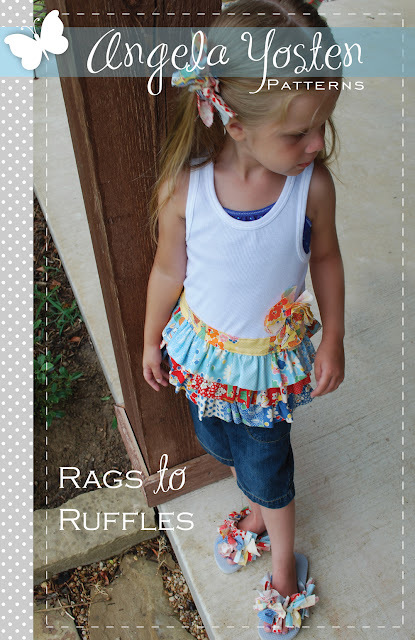 I will be sending one lucky winner my first pattern, Rags to Ruffles. AND the fabric to make it. One charm pack and mini honey bun from the Aviary collection by 3 Sisters for Moda. So, go now and leave a comment with Miss Print on the July 17th post! I Love it!! Cant wait to see all your others!! Whether I win it or buy it, I absolutely love this pattern, and I can just picture it on the adorable little girl that I will be making it for. I just found your Blog via Pat Sloan's Blog, and I am adding you to my list of Bloggers to Follow. Keep up the good work! Can you make some of these in big girl sizes (for us over 20 year olds?) these are just too cute to believe! So cute, love this pattern!